Robert Foster and his wife, Shannon, are heading back home from his father's funeral when he hits a young girl with his car. Frantic, he rushes to find seek help and comes upon an old farmhouse, unaware that the house has been waiting for him. The Hanover House is the first feature length film from Maine filmmaker Corey Norman who gave us the highly effective shorts The Barn and NATAL. Both of these short films allowed viewers a glimpse into the type of filmmaker Norman is striving to be and his penchant for easily creating an escalating sense of dread and constructing an eerie atmosphere. And since one of the selling points of The Hanover House is the fact that it was filmed in a real life haunted farmhouse, Norman certainly provided himself the perfect setting to put his talent to work. And he does not disappoint. First, I cannot express just how great this film looks. IMDB has the budget listed at roughly $22,000, and I do not think I have seen a better looking horror film this year. The direction is tight and the cinematography is clean and crisp with some breathtaking images of the Maine countryside. Many times, films with small budgets struggle to overcome this constraint when it comes to visual aesthitics, but this is not the case with The Hanover House. Night scenes are lit appropriately, which is crucial to the third act of the film. Speaking of which, the film moves along at an appropriate pace, though some may feel the exposition and second act drags a bit. It is here that the film plays out more like a dramatic character study than a horror film set in a haunted house. Our protagonist is not a happy-go-lucky family man that is often associated with these types of films. Instead, Norman (who penned the screenplay with his wife, Haley) is not afraid to give us a flawed, damaged protagonist in Robert Foster who has been shaped by a pretty miserable childhood and family life. His mother (a great supporting turn by Anne Bobby) is not the most supportive and loving woman, and his uncle is downright repulsive. Brian Chamberlain is very impressive as Foster and easily displays the emotions of a man stuggling to overcome his past so that he can embrace his future by starting his own family. Turner is servicable as his devoted wife, though her performance drastically improves as the film the progresses. As a whole, the entire cast is very good and their performances are much better than what you'll see in most low budget film, though Chamberlain is the standout. Once the action moves from the funeral to the actual house referred to in the title of the film, there are plenty of chilling moments. Of course, hitting the little girl is a somewhat symbolic catalyst that allows Robert to seek out help at the house, and the scene of handled in an effective and realistic manner. The scenes inside the farmhouse often have a very etheral look and feel to them, which aids in creating that incredible atmosphere that Norman is so proficient in achieving. Besides the typical creaks and moans associated with a typical haunted house film, there are some eerie visual elements that are speficic to Robert and his own personal demons. To say much more would give away specific plot elements. The ending of the film is surprising and definitely not "safe" but adds another layer to the film's plot that moves it beyond just being a "haunted house" flick. Though this truly is a good film with little to complain about, there are just a few minor issues that some may find problematic. First, as mentioned, the exposition and second act of the film is quite lengthy and plays out like a dsyfunctional family soap opera rather than a genre film. This provides valuable characterization for the lead, but some of the more interesting secondary characters aren't given much to do in the grand scheme of the film; Anne Bobby is particularly underutlized. Additionally, the actual house is a great settting and there are some creepy scenes, but it seems like more could have been done to amp up the horror elements a bit. The "ghost girl" has been done to death in these types of films, and it would have been interesting to see a different approach used. 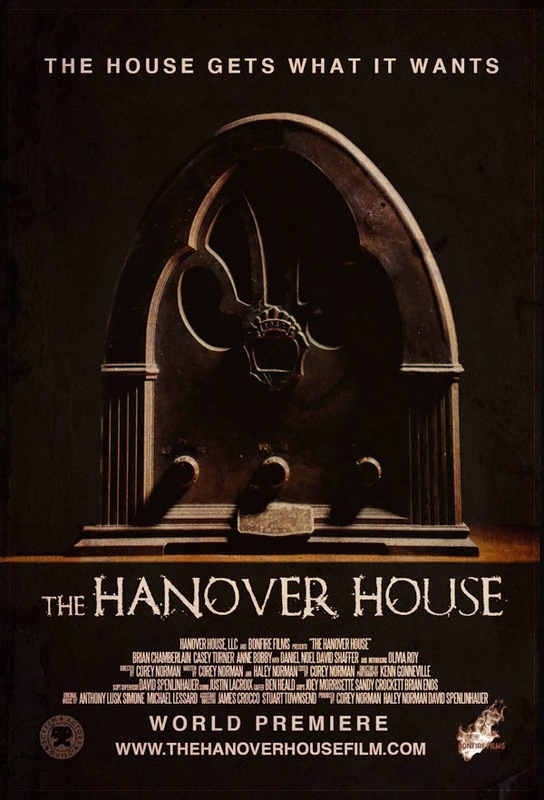 Overall, The Hanover House is extremely well made and should be a paramount example to aspiring independent filmmakers of how to do it right with very little. It's obvious that The Hanover House was constructed with passion and care. This film, along with his short NATAL, has the potential to and will hopefully catapult Norman to the front of the pack of independent horror filmmakers in terms of recognition and accolades.